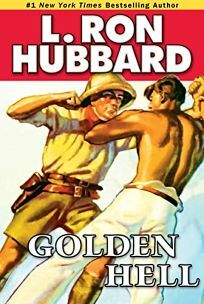 Some may wonder who the intended audience is for these two undistinguished pulp-era action novellas from Hubbard (1911-1986). The title story concerns the travails of a mining engineer who risks his life in pursuit of gold and finds himself trapped in a hellish cavern in the Gobi desert. Readers should be prepared for racial stereotypes: Mongols are ""yellow-fanged demons""; a Chinese moneylender in the second novella, ""Pearl Pirate,"" is described as ""the greasy fat Chinaman."" Occasionally nonsensical prose (""If ever Ichabod Crane fled from the Headless Horseman, he would have had to travel very fast to even keep up with me"") doesn&apos;t help. Those looking for thrills and brushes with death have plenty of modern authors better able to keep the pages turning. Extras include an excerpt from another, similar adventure story, and a glossary aimed at helping readers with ""uncommon words or expressions of the era"" (such as Dante Alighieri, Sir Francis Drake, and G-men).